The Tablets of Fate have been stolen. Lord Ao, creator and ruler of the gods, is furious. 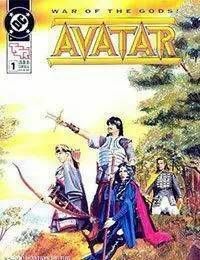 And the Earth will be made to suffer the price of his rage as he banishes the gods to the realm of humans and elves in the latest of the DC/TSR comics line, AVATAR. The gods will stop at nothing to recover the stolen relics and appease Lord Aos anger...and the gods help any human (or other being) who gets in their way.